Conservation in action, draining contaminated oil from the sump of Mephisto. 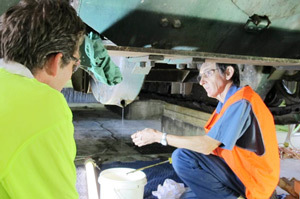 Working in close quarters, conservators inject a rust inhibitor into a gearbox to prevent any further corrosion. It’s taken almost a year but the sensitive conservation of the 30 tonne one-of-a-kind World War 1 tank, Mephisto, is complete. 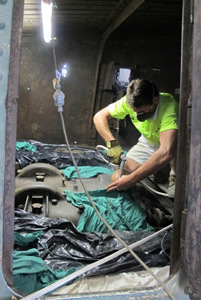 Removed from its home of 20 years to a special facility on Brisbane's northern outskirts in October 2011, the tank has been given the once over by one of Australia's foremost metal conservators. The conservation assessment has shown the A7V tank is in relatively good condition, given its age and previous exposure to the elements. The specialist treatment involved delicate cleaning and stabilisation techniques using compressed air, brushes and vacuums, degreasing solvents and corrosion inhibitors. Almost 20 litres of dust, dirt, grime and iron scale has been collected in the vacuum cleaner alone! The discovery of WW1 barbed wire in the top section of the tracks was a surprise for the team considering samples of this had already been found and removed from the tracks during earlier conservation treatments. While working inside the tank, the conservation team continually commented on the cramped space the many young soldiers who were operating the tank were forced to endure during battle. The conservation treatment will ensure Mephisto continues to amaze Museum visitors for generations to come. Mephisto is now in its permanent home at Queensland Museum, South Bank. Mephisto is currently unavailable for public viewing but will go on display again later in 2018 when the new Anzac legacy gallery opens.